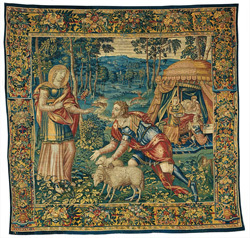 All of the colors in the tapestries in this exhibition were produced by natural dyes derived from animal or vegetable substances. Chemical dyes (also known as synthetic or aniline dyes) were not invented until the second half of the 19th century. Natural blue dye was produced from woad and the indigo plant. Woad is a European palnt whose leaves have been used for dyeing since ancient times. Roman authors Pliny and Vitruvius both mentioned dyeing textiles with woad. The indigo plant, which is found in China, India, Japan, West Africa, and Central and Latin America, produces the distinctive blue-purple color of the same name. Europeans had access to indigo by the early 1600s. Red dye was produced from the cochineal insect, brazilwood, and madder. Cochineal dye, which yields a crimson color, consists of the dried and crushed bodies of the female Dactylopius coccus beetle. It was first imported to Europe from what is now Mexico in 1518. Brazilwood, another source of red, is wood from any of several tropical trees. Though the primary source of brazilwood were the Americas, it had also been imported to Europe from Asia since the Middle Ages. Finally, rose madder is one of the oldest dyes known and has been used all over the world since ancient times. It comes from the root of the madder plant, which was already being cultivated in Italy during Roman times. The Meeting of Jacob and Rebecca, and Isaac Blessing Jacob, from The Story of Jacob, 1555/60. Flanders, Brussels. Gift of Sanger Robinson.